A reader in Germany has sent us news of PN appearing as an artefact in an art exhibition! 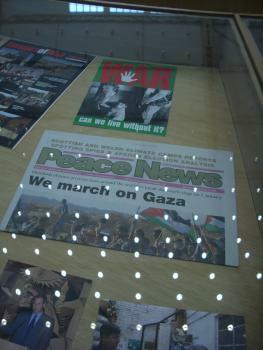 A display case in the 'Picasso and contemporary art' exhibition in the gigantic Deichtorhallen art centre in Hamburg, Germany, contains a recent edition of Peace News! Rolls-Royce directors were confronted with the harrowing testimony of a Hiroshima survivor, Setsuko Thurlow, at their AGM on 1 May. Although the quote was lengthy, the chair was too disorientated to interrupt, and the board responded with nervous laughter. Rolls-Royce provides power systems for Britain's Trident nuclear-powered, nuclear-missile-carrying submarine system. In June 2012, Rolls-Royce was awarded a £1bn contract to produce new reactor cores for the submarine that is intended to replace Trident. At the Rolls-Royce AGM, Sheffield peace activists asked about the impact of a nuclear strike on shareholders, alternative uses for Rolls-Royce technology such as green energy, and whether taxpayers would have to pay for the lost investment if the Trident nuclear submarine system is not replaced. At the end of the AGM, activists held up banners saying: ‘No Trident’ and ‘Trident Kills’.